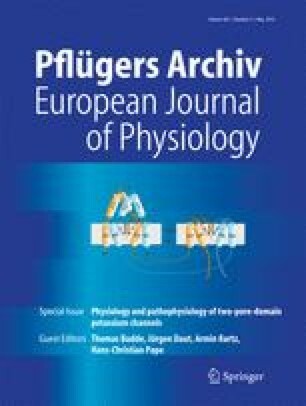 Kv1.5 blockers preferentially inhibit TASK-1 channels: TASK-1 as a target against atrial fibrillation and obstructive sleep apnea? Atrial fibrillation and obstructive sleep apnea are responsible for significant morbidity and mortality in the industrialized world. There is a high medical need for novel drugs against both diseases, and here, Kv1.5 channels have emerged as promising drug targets. In humans, TASK-1 has an atrium-specific expression and TASK-1 is also abundantly expressed in the hypoglossal motor nucleus. We asked whether known Kv1.5 channel blockers, effective against atrial fibrillation and/or obstructive sleep apnea, modulate TASK-1 channels. Therefore, we tested Kv1.5 blockers with different chemical structures for their TASK-1 affinity, utilizing two-electrode voltage clamp (TEVC) recordings in Xenopus oocytes. Despite the low structural conservation of Kv1.5 and TASK-1 channels, we found all Kv1.5 blockers analyzed to be even more effective on TASK-1 than on Kv1.5. For instance, the half-maximal inhibitory concentration (IC50) values of AVE0118 and AVE1231 (A293) were 10- and 43-fold lower on TASK-1. Also for MSD-D, ICAGEN-4, S20951 (A1899), and S9947, the IC50 values were 1.4- to 70-fold lower than for Kv1.5. To describe this phenomenon on a molecular level, we used in silico models and identified unexpected structural similarities between the two drug binding sites. Kv1.5 blockers, like AVE0118 and AVE1231, which are promising drugs against atrial fibrillation or obstructive sleep apnea, are in fact potent TASK-1 blockers. Accordingly, block of TASK-1 channels by these compounds might contribute to the clinical effectiveness of these drugs. The higher affinity of these blockers for TASK-1 channels suggests that TASK-1 might be an unrecognized molecular target of Kv1.5 blockers effective in atrial fibrillation or obstructive sleep apnea. Aytug K. Kiper, Susanne Rinné, and Caroline Rolfes contributed equally. This article is published as part of the Special Issue on K2P channels. We thank Oxana Nowak for excellent technical support. We are grateful to Klaus Steinmeyer, Klaus Wirth, and Heinz Gögelein from Sanofi-Aventis for the support in our studies. This work was supported by a grant of the Deutsche Forschungsgemeinschaft (DE-1482/3-1 and DE-1482/3-2 to N.D.) and the Anneliese Pohl Habilitationsförderung der Anneliese Pohl Stiftung to S.R.